Long distance swimming is an endurance activity that commonly includes distances of 5, 10 or 25 km open water competitions. With the specific challenges of the endurance event in open water, your swimming techniques and training must meet those challenges to maximize performance. These techniques include the ability to maintain an efficient stroke and pace for long distances, along with an enhanced aerobic capacity. Long distance swimmers must have an efficient stroke to create power without significantly increasing heart rate or breathing rate. 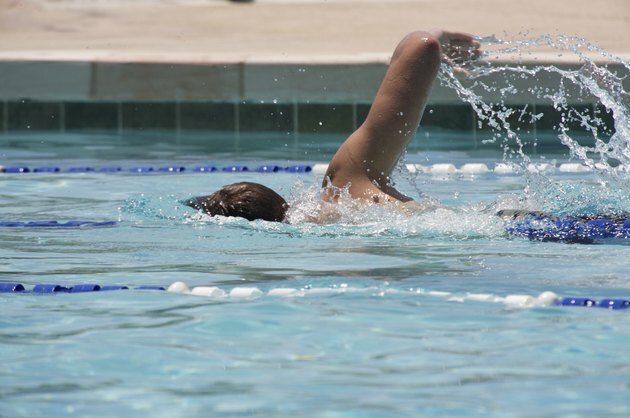 According to swimming coach Toby Huseman, proper stroke technique is the most important consideration for maximizing performance and preventing injuries. With a more efficient stroke, you use less energy by maximizing the distance covered per stroke. An efficient stroke is characterized by an emphasized long body line and hip and shoulder rotation. Similar to a long distance running or cycling event, long distance swimming requires specific training techniques for gradual progression up to the given distance. For example, during a training session, swim 50 meters at a specific pace for a 10 intervals. Gradually increase the distance to 75 meters and 100 meters as your fitness level and stroke efficiency improve. The increased intensity and volume force your body to withstand the physical demands of a long-distance swimming event. A general approach to gradual progression covers a time frame of 12 to 16 weeks. While traditional long distance swimming training techniques focus on long, slow, distance swimming workouts, using interval training workouts is effective for improving your lactate threshold -- defined as the intensity level where lactic acid accumulates in the blood stream. By raising your lactate threshold, you improve your long distance swimming ability by increasing the level of intensity that can be sustained for an extended period. Interval training swimming workouts are characterized by alternating periods of work and rest for a specific number of rounds. For example, 15 rounds of 100 meter intervals at a fast pace with 30 seconds of rest between rounds builds strength and cardiorespiratory endurance, along with improving stroke efficiency. Tempo workouts -- or steady state training -- are a training technique that teaches your mind and body the pace and stroke rate used during the long distance swimming event. During a tempo workout, the goal is to maintain a steady pace over an extended period. The length and duration of the workout depends on the distance of your event. By using tempo workouts, you strengthen your cardiovascular system along with building confidence that you can sustain that pace and energy level for the entire duration of the event.